The purpose of consumer personas is to elicit empathy within the marketing, management, and sales process as it relates to the customer experience. Personas are neither real individuals nor should they be dated stereotypes. 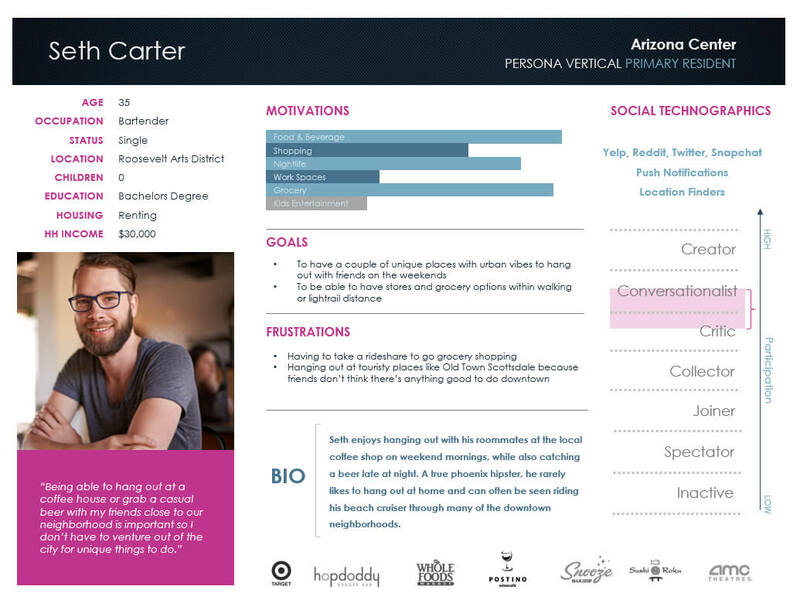 Personas should be created to illustrate fictional representations of the top targeted consumers for the business or product. Rather than assumptive models, personas should be created with backed research from reverse profiling databases or other forms of consumer data, where you can breathe life into them through more qualitative measures such as interviewing current and potential customers as well as sales associates. It is important that the information and data points collected and illustrated on the persona be relevant to the product or service as well as have the ability to evolve and stay effective over time. If the personas become stagnant, they can lose touch with the target market, leading to stereotypes, misplaced empathy, ineffective marketing plans, and lost sales. It’s easy to fall into stereotyping when creating personas because, when considering the customer experience, we all have our own experiences and ideas of who the business appeals to and who would be the most appropriate consumer. However, consumers are evolving more than ever. For example, gender roles are evolving, the economics of shopping are evolving, and generational behaviors are evolving. Therefore, socio-demographics, attitudinal, and behavioral attributes of the target market and personas must be continuously readdressed. Stereotypes and failure to adjust to market and consumer changes can lead to marketing myopia. Marketing myopia was defined by Harvard Business School professor Theodore Levitt (1960) as, “a short sighted and inward looking approach to marketing that focuses on the needs of the company instead of defining the company and what it provides in terms on the customer’s needs and desires.” The result of this is failure to adjust to rapid changes in the market, leading to missed revenues and struggling customer service initiatives. Creating realistic, research-backed personas which evolve and are continuously reassessed can avoid unnecessary tapering of ambitions and exclusion of customers, and the resultant inaccurate view of the customer experience. Women in gaming is an interesting example of industry evolution driving consumer evolution. The most popular format of gaming has shifted from console gaming to apps on smartphones and tablets. 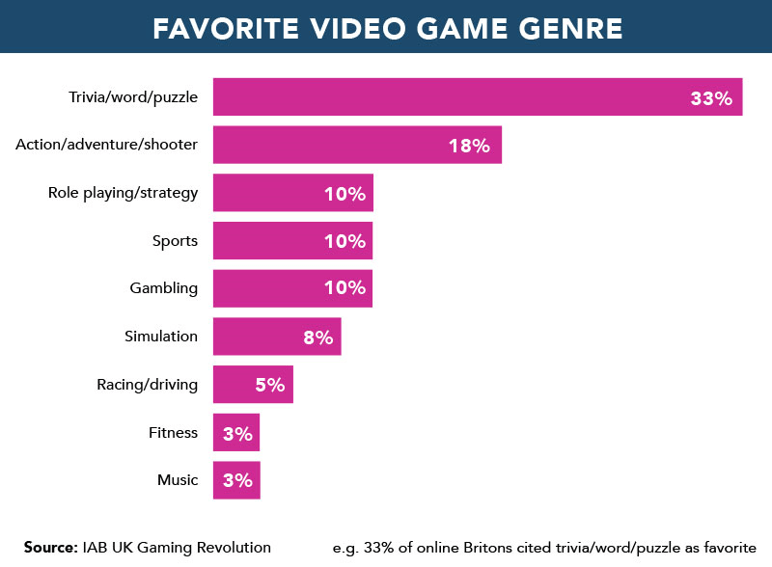 The “Gaming Revolution” study conducted by Populous in Britain showed that the gamer audience of England has reached 33.5 million, nearly 70% of the population. Of those people, more fall into the 45+ age than 17 and under. However, the largest segment of consumers are women aged 22-44 consuming trivia, word, and puzzle games. Because of this, more women are accounted to be playing video games (52%) than men according to the Internet Advertising Bureau (IAB). As the gaming industry became more competitive and technology advanced away from console gaming to mobile gaming, app developers seized opportunity to capitalize on the low barrier to entry in the market. According to the Internet Advertising Bureau (2016), apps are now the most popular video game format (55%) over online games (48%) and console games (40%). The majority of app games are free with advertisements, which has driven their popularity. Because these games are supported by advertisements built into the game, understanding the consumer is ever important. The average gamer who is over the age of 16 spends 11 hours per week playing. The most popular hours for gaming are between 6-8 pm. The demographic, attitude, and behavioral data collected for gaming is essential in creating the best personas to create marketing campaigns around, media buys, and overall staying relevant in the evolving marketplace. Advertisements keep much of gaming free to the consumer, especially those who are using apps. Sixty percent of gamers stated they’re actually happy to see advertising appear if it keeps their gaming free. Twenty-four percent of gamers believe that advertisements can make the game more immersive and realistic. However, getting ads right in gaming must be a refined skill, as they must be hyper-relevant and non-intrusive. Understanding who’s playing them, at what time, for how long, what their interests are, and how they prefer to consume media are all musts. The right research leads to the correct consumer personas and correct placement of targeted ads which have the most impact. This is especially important in gaming since nearly twice as many ads are accepted by consumers in free games compared to paid gaming (Internet Advertising Bureau, 2016). “The basis on which a good repute in any highly organized industrial community ultimately rests is pecuniary strength; and the means of showing pecuniary strength, and so of gaining or retaining a good name, are leisure and conspicuous consumption of goods,” Thorstein Veblen, The Theory of Leisure Class (1899). A dated theory which still holds true today, class is not necessarily associated with the consumption of high-end goods. However, this notion is often overlooked by marketers and the segmentation of target markets and personas. Many times non-affluent consumers seek luxury goods in order to emulate status and wealth. In the 1500-1600’s laws prohibited lower social classes from wearing particular types of clothes or jewelry, including the maximum price an article of clothing or jewelry could cost. These laws were broken out and varied by social class in order to distinguish individuals within social classes and create a recognizable social hierarchy. However, in the 1800’s social classes began to blur and these laws began to diminish. Today, anyone can own any type of good, whether it be a generic brand or notable high-end brand and anything in between. Instead of distinguishing class by goods, our economics have evolved to distinguish class by branding. In turn, non-affluent consumers have also evolved with the economy to learn to buy their status through brand prominence, which is defined as the conspicuousness of branding on a product. These consumers have a large representation in the marketplace and are often forgotten in personas and target demographics. They found that consumers with low affluence, high status and signaling-need overwhelmingly preferred the second bag due to its brand prominence and price, whereas consumer with high affluence and low status and signaling needs preferred the first bag. This is something that some marketers such as Gucci have caught on to and have learned to price and market their products accordingly to status, signaling, quality, and branding. Baby Boomers have been a staple demographic in marketing segmentation for years, as they have been the largest commercial generation until, more recently, Millennials came along (who are still developing their spending power). As brands continue to innovate both advertising and operations, their innovation seems to go hand in hand with technology. However, the best practices, user experience, and information architecture for how innovation and technology is adapted by older consumers is not always measured by brands. Generally speaking, this is another area which is dominated by stereotypes over stats. PEW research shows that as of early 2016, both younger and older boomers have a high adoption rate to internet use. Yet, when it comes to social media use, the adoption rate drops significantly. When looking at what devices boomers use, just as many boomers have cell phones as Generation X. Yet, smartphone adoption is only 53% compared to Generation X at 77%, and Millennials at 88%. 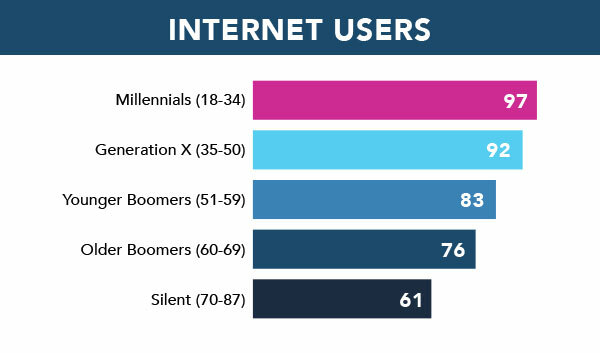 What we found most interesting was that tablet use in boomers was almost equal to that of Generation X and Millennials. It’s important for markets to collect this type of data when creating personas on their boomer demographics, especially if it’s necessary to create an effective digital marketing plan. Without the proper research into these personas, there are lost revenue opportunities when it comes to Baby Boomers. 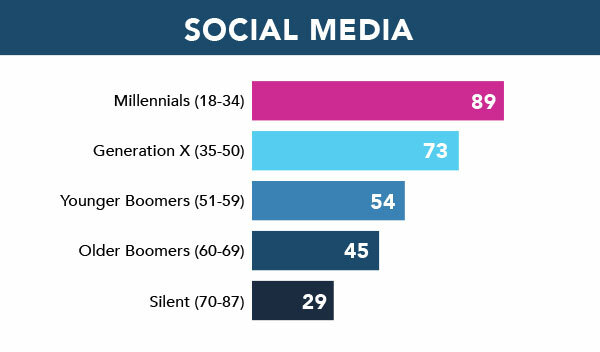 Millennials are quickly becoming the new focus of many marketers as they are set to pass Baby Boomers as the United States’ largest living generation. Baby Boomers have been studied by marketers for many years, whereas little attitudinal or behavioral research has been done in comparison. Millennials may be the most misunderstood demographic we deal with as marketers, and just as we begin to think we understand them, they evolve along with the myriad of products and services they consume. Often stereotyped as apathetic narcissists, hyper-emotional, over spenders, under spenders, wired into their devices, or lost in the wild; it often seems like a vain attempt to appeal to this entire generation. Millennials were born into many mediums of consumption and into a world already deeply penetrated by advertising. Often overlooked are the traditional marketing tactics towards Millennials. We were surprised to find that, according to a 2016 Valassis study, Millennials are surprisingly responsive to coupon use and traditional marketing. When it comes to retail, consumers have many ways to shop. They also have many ways to find discounts. Millennials have increased their use of coupons more than any other generation in the past year by 47%. Over one-third of Millennials use coupons they get from the mail, newspaper, or coupon book and nearly half use paperless, or digital, coupons. Although they haven’t surpassed in the ratios of coupon use of Generation X and Baby Boomers, the Millennial spending power is increasing as they age and as their psychographics evolve faster than any other generation. When it comes to the Millennial persona, it is important to conduct or find new and relevant data points on socio-demographics, attitudes, and behaviors. The purpose of these examples are to illustrate the importance of accurate data collection and dissemination through the use of personas by avoiding prejudices and stereotypes that can lead to mismanaged marketing plans, campaigns, and lost revenues. The power of personas is great for eliciting empathy as well as disseminating curtail data that can help in campaign development, targeting, retargeting, media buying, messaging, operations, and beyond. By treating your customers as individuals and having the right information, it makes it simple to avoid stereotypes. While we can’t target consumers one-by-one, we can approach the market segments more intelligently and effectively through personas.